I am the cover star of the GO! entertainment section in today’s Citizen, the newspaper Milton Keynes residents have popped through their letterboxes every Thursday. (Although mine often arrives on a Friday evening, sometimes on a Saturday morning and, occasionally, not at all). This is the artwork I did for the cover. Inside, journalist Sammy Jones is writing a piece promoting my Borders signing this Saturday. If you're a MK resident who can't wait until then to get a copy of Book of Lists, then you can buy a copy now from the Milton Keynes Art Gallery, Waterstone's Midsummer Place, Milton Keynes or directly from this website from The Shop. Thanks to everyone who made my presence at BICS last weekend a success for me. My next event is this Saturday when I will be be signing copies of Book of Lists in the Milton Keynes Borders store. This is the first non-comic specific venue that I've attended to promote my work so it's an unknown quantity to me. If you're in the area, please drop in and say hello. They've got a good graphic novel section there, anyway. I will be signing my comics between midday and 6 PM. BASTARDS, British Artists Standing Tall And Reaching Distant Shores, is an anthology put together by Francesca Cassavetti and Dan Lester for this year's Angoulême international comic festival in France. 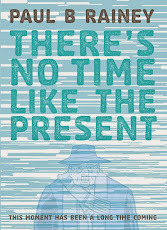 It features the work of some of the best artists from the British small press scene at the moment including Francesca, Dan, Sean Azzopardi, Philip Spence and many others. My strip, Goddard and Prisk is in print there for the first time as well. 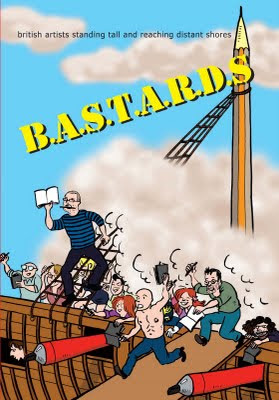 BASTARDS should be available to buy in three weeks time, but in the meantime, I will have an advanced copy with me at BICS this weekend if you're interested in having a look at it.